Screw booster air compressors employ boosters to conduct secondary compression on compressed airs, thus helping the whole system achieve an outlet pressure of 4.0Mpa. The exclusive advantages of oilless and waterless air compressing system make screw booster air compressors prevailing internationally. In comparison with conventional air compressors, screw booster air compressor has advantages of reliable air supply and is easy to use and maintain. 1. Low noise and excellent properties. The screw compressor is characterized by steady operation, which results in low noise. Meanwhile, its connection with the booster is totally enclosed. This further assists in reducing machinery operation noise. A screw booster air compressor system is composed of a screw compressor, booster compressor, air storage tank, and air purifier. With scientific design and rational overall arrangement, it can save space and facilitate installation for you. 3. Oilless and waterless air compression. The screw booster air compressor has the function of air purification. Hence, the oil content in worked air is less than 0.001PPM and the dew point is -23℃. 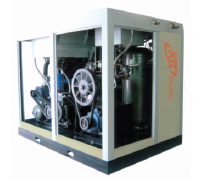 We are a primary screw booster air compressor manufacturer based in China. The company has obtained the ISO9001:2008 certificate. We are specialized in producing piston air compressors, centrifugal air compressors, air filters, air receivers and so on. All these products we offer are certificated with CE and TUV. Located in fairly large modern port city, Shanghai, we are provided with convenient transportations either by sea, land or air. You are very much welcomed to visit our company or just email and call us directly for detailed information. Stationary Screw Air Compressor1. Made of superior quality Bao steel cold-rolled plates, and coated with 250℃ high temperature baking finish, our stationary screw air compressor is characterized by aesthetic appearance and good corrosion resistance.